I just love, love, love how quick and easy most asian rice and noodle dishes are to prepare. This one is no exception. It’s not ‘one size fits all’ either! I like to make yakisoba or fried rice at the end of the week to use up fresh produce or even incorporate other leftovers. 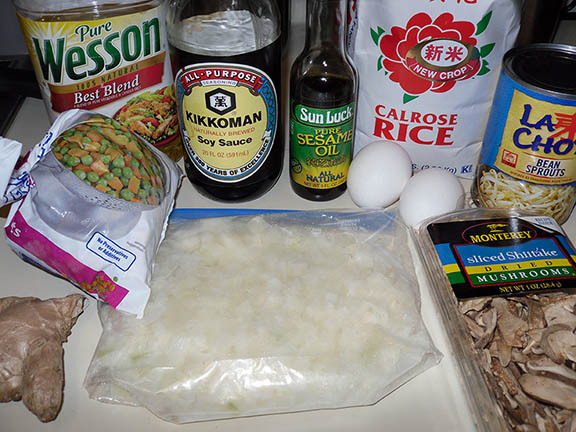 It’s a great way to ‘waste not, want not.’ Today we’re going to talk about Fried Rice. The first thing I’ll tell you is to get a wok. They are a fantastic and invaluable tool. Mine is nearly always in the dish drainer rather than the cabinet because I use it so frequently. They heat really evenly and cook meats and veggies in a flash. Make sure you get oil with a high tolerance for heat, you don’t want to pick up nasty flavors from over heating a low smoke point oil. Peanut and canola blends are a pretty safe bet. 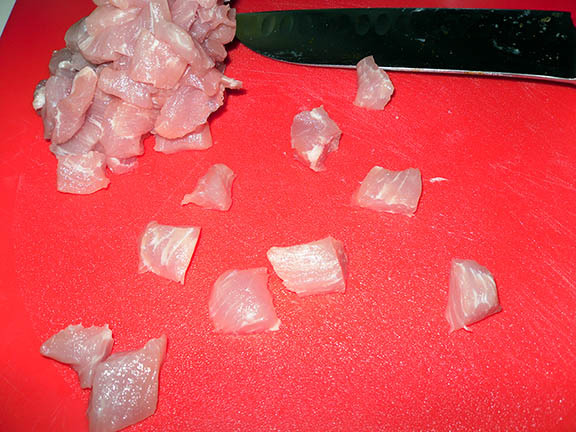 Cube your meat into 1/4 inch pieces. 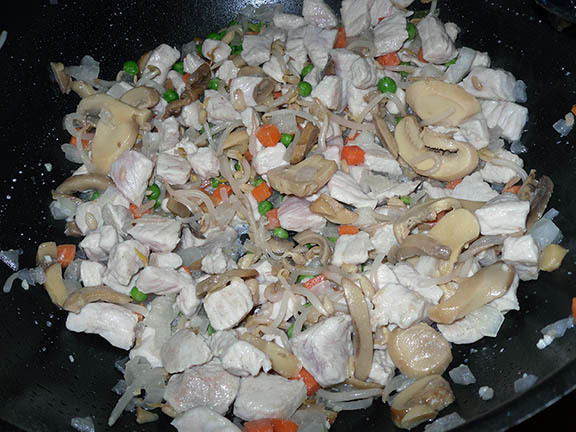 The more uniform the size of the pieces, the more uniform the cooking time. Heat 1 tablespoon of your oil in the wok over medium high. 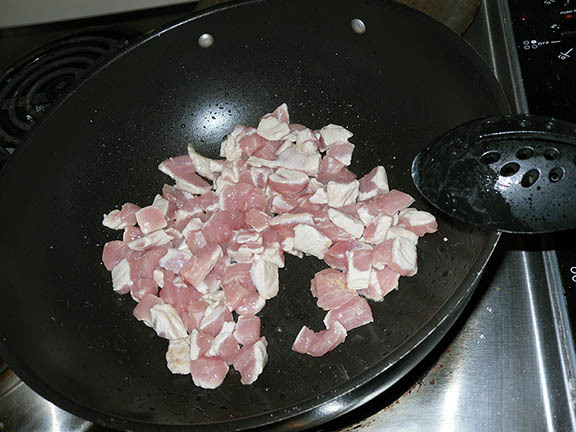 When the wok is hot, stir fry your meat for 1-2 minutes and then add the onion, garlic & ginger. I usually throw in my meant and grate the ginger and garlic right into the wok. Careful you don’t scorch your garlic – it get’s bitter! Plop your done meat into a bowl and keep warm. leave the meat in for the rice cooking step. Add your meat back to the wok now that the rice has some color. Add your frozen peas and carrots, I usually leave them on the counter while I assemble the rest of this so they are cold but not rock hard by the time I add them (they are so small they thaw and heat really quickly anyway). Season with the sesame oil & pepper. Once everything is nice and hot, make a well in the dead center of the bottom of the wok. This is for your egg. 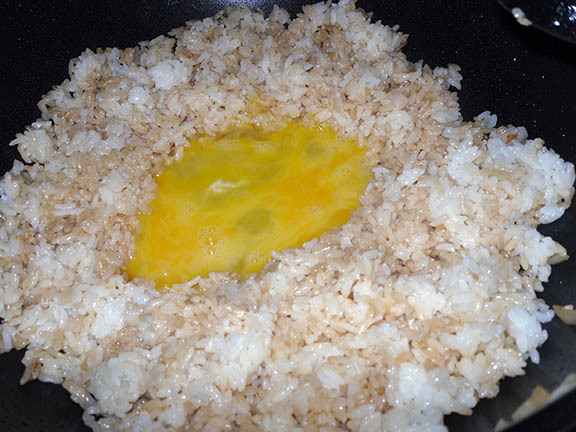 Pour the scrambled egg into the hole and scramble it the best you can in the tight space. It doesn’t matter if rice gets mixed in. I sometimes add mushrooms and other fresh veggies at the same time as the meat so they get cooked through – ‘crisp tender’ as they say. If you are using precooked meat, like from leftovers, you can skip the entire first stage and just add it in after the rice gets a bit brown. This is really a great dish, just the way YOU like it. Make it your own, let me know what you come up with!